When most people hear the term “hybrid,” they think of a tiny, fuel-efficient car, cruising down the highway in the HOV lane. But in the world of home building, a hybrid refers to something very different — a house that mixes at least two different building methods. Today’s timber-home companies are maximizing on this trend, offering more and more options for combining traditional timber framing with other rustic elements, including stone, shakes, wood siding and, of course, logs. 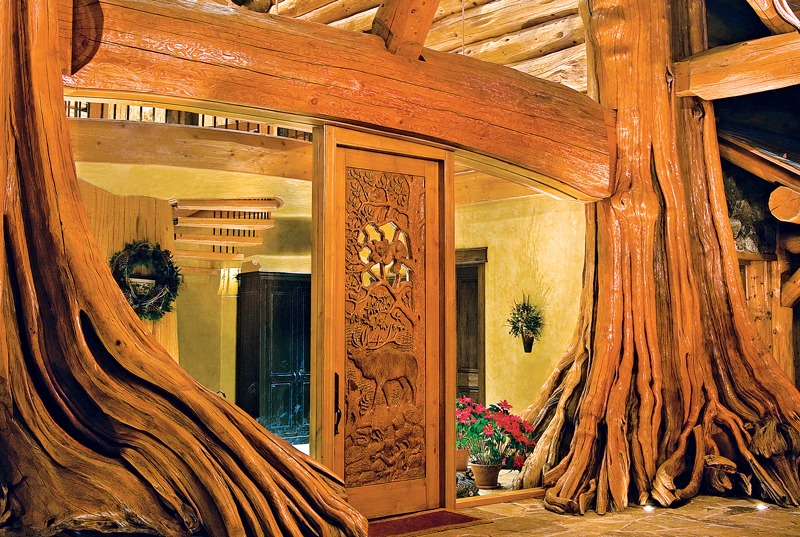 “A log cabin is a log cabin is a log cabin — in other words, the rustic factor is dialed up to the top,” says Bert Sarkkinen, owner and chief designer at Arrow Timber Framing in Battle Ground, Washington. “Whether it is tall or wide, big or small, visitors are left with the impression that it’s still a log cabin. Fortunately, there are ways to add logs to a timber frame to bring in a little rusticity while still enjoying the design flexibility that comes with a timber home.” According to Sarrkinen, there are three basic ways with which you can have fun enhancing your timber frame using log elements. Oversized logs are great to use as main beams and support posts in a timber home. “One fascinating option is using logs that have been cut down at or below ground level,” explains Sarkkinen. “This will allow your posts to look as if they are growing straight out of your floor, as the base of the roots will actually show.” Many companies feature logs cut this way, making them a unique option for a tall center post in an entry or living space. 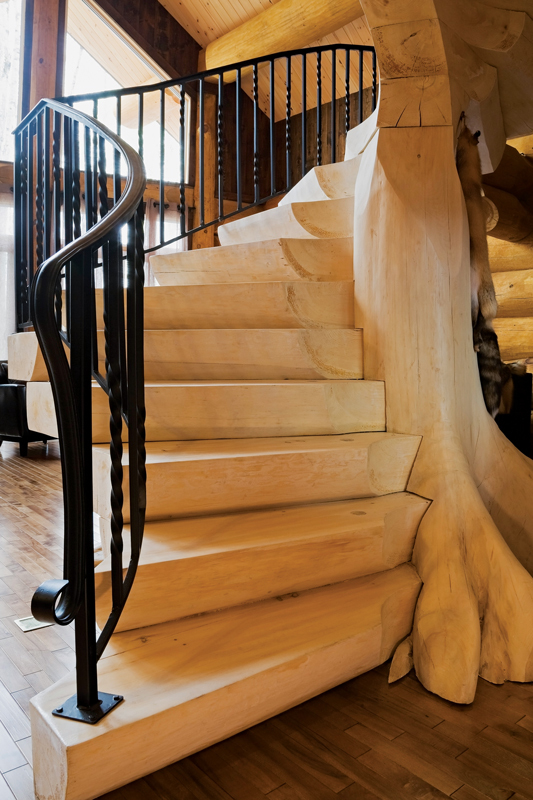 Another eye-catching design idea: Build a spiral or switchback staircase to wrap around the tree trunk, making it an instant focal point in your home. If you’re a timber-home enthusiast, chances are you appreciate the beauty of wood in all forms. If you’re exploring your property and come across a particular piece of wood or a unique log and find yourself wondering how you could incorporate it into your timber home, work with your design team to make it work. Also, many companies will actually search for a specific piece of wood to suit your size, shape or style needs. Sarkkinen explains that Arrow Timber Framing has incorporated these kinds of special pieces on many occasions. 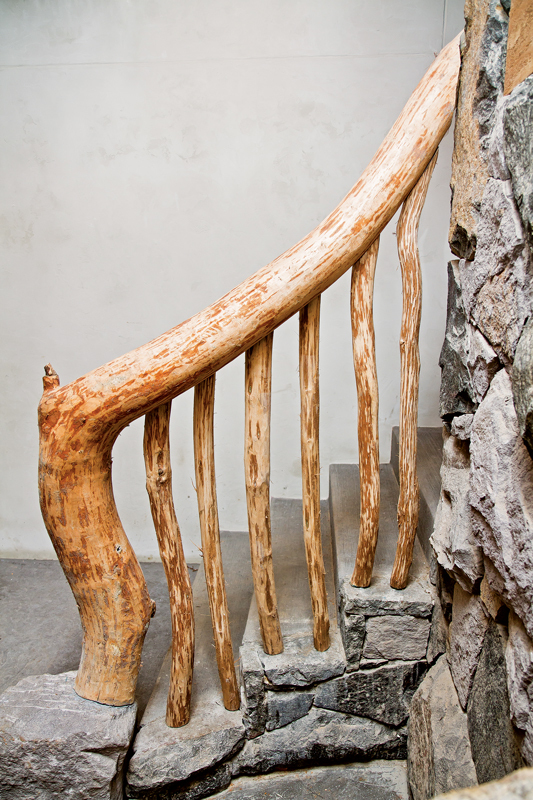 “From woven branches to heavy gnarled trunks, we’ve found unique pieces of wood to use for stair rails,” he says, adding that they’ve also used the same types of wood pieces as mantels, shelves and even frames for art. According to Sarkkinen, logs also can be used in subtle ways throughout a timber home, resulting in unexpected design details that add one-of-a-kind charm and character. “Even though these details are often subtle, they don’t have to be small in scale,” he explains. If you love the look of a timber home, but don’t want to spend the money on a full frame, consider incorporating timber accents into your design. 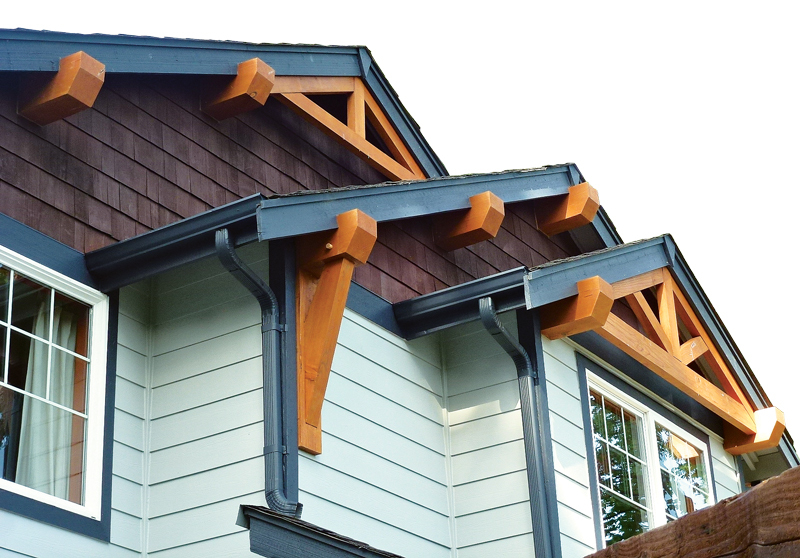 Timber accents are perfect for adding wood detailing to a porch or entryway, along exterior gables and to a hearth in the form of a mantel or fireplace surround. You also can add timber beams to a ceiling to give the look of a frame overhead without paying for the real thing. While you can customize timber accents for your home’s exterior and interior spaces, some companies even offer stock accents that are easy to purchase and install.